At the Clinton Global Initiative conference in Chicago, June 13, President Clinton acknowledged the work to create Open Badging for Learning by UCHRI/HASTAC (David Theo Goldberg, Director of UCHRI and co-founder with Cathy Davidson of HASTAC), Mozilla (Mark Surman, Executive Director), and the MacArthur Foundation (Connie Yowell, Director of Education). 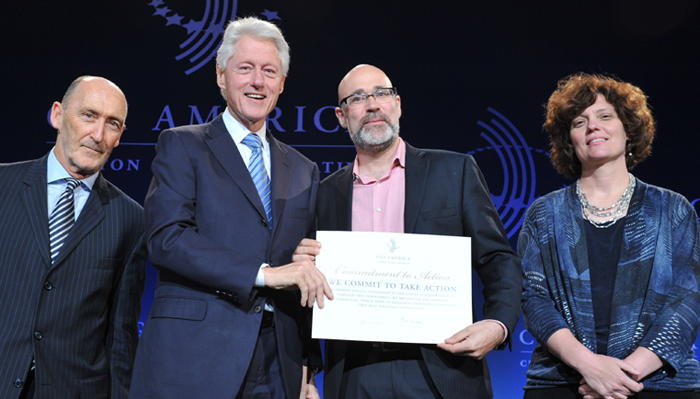 Speaking at the Clinton Global Initiative America (CGI America) meeting, an annual event of the Clinton Global Initiative that seeks innovative solutions for economic recovery, Clinton said three partners – the MacArthur Foundation, Mozilla, and HASTAC – have created the commitment to Open Badges. Outreach and technical assistance will be provided to help employers and universities across the country incorporate Open Badges in hiring, promotions, admissions, and credit over the next three years.